Throughout history ear piercings have often represented a life milestone as well as standing in society. Turquoise earrings are among the most memorable forms of jewelry. Through history, earrings have been crafted of numerous materials including bone, shell, and precious metals and gemstones. The Turquoise Earring has been celebrated for the belief they promoted clear thought and improved communication, turquoise earrings have, and remain to be, one of the most popular styles of earring. The most popular Turquoise earrings styles are the hoop, dangle, and post varieties. Turquoise hoop earrings come in two varieties: full- and half-hoop. Hoop Turquoise Earring styles stem from these two base styles. Full-hoop earrings are simple, but make a bold fashion statement. Hoop style Turquoise earrings are generally plain wire or tubing fashioned into a ring; wire hoops are often worn as-is, tubing hoops are strong and can support beadwork and dangles. Half-hoop earrings are less bold than their counterparts, but are equally fashionable; what they lack in size, they make up for in usability. Turquoise is beautifully incorporated into half-hoops with inlay and beading techniques. Inlaid turquoise can be placed on the outer rim of the Turquoise hoop earrings for a crisp, clean look. Turquoise dangles or clusters can be attached for a casual, airy style. The introduction of ear wires has created a blank canvas for turquoise earring designers. A great number of dangle Turquoise earring designs can be made using them as a base on which to decorate, or as a decoration itself. While some designers have chosen to beautify the wire by attaching turquoise to it, the real attention grabber is the dangle. 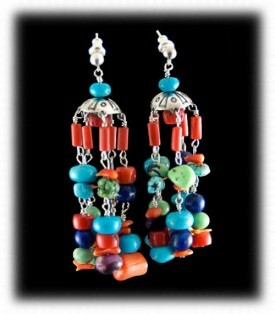 The dangle Turquoise earring can range from a large chandelier pendant to a simple beaded cluster. Combining the free flowing motion and charm of turquoise, dangle earrings draw even more attention to the face. This style of turquoise earrings adapts well to any outfit and occasion. Post, or stud, earrings are the most simple but also sophisticated earrings. 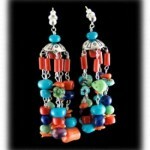 They can have a dangle turquoise earrings attached to them, but they are traditionally a single stone set on a post. Other turquoise post earring styles incorporate the mounting into the design; the post earrings are designed so the stone is the primary attention grabber. Because turquoise is a soft stone, it can be cut into many shapes and sizes, which makes it a logical and attractive choice for post earrings. Thank you for reading and learning about Turquoise Earrings.